When you think about tools that help with onboarding new hires, sales engagement platforms probably aren't the first things that come to mind. But a couple of Groove features can help make the process smoother. Groove Flow lets you equip new team members with your battle-tested engagement process, including email content, call scripts, and touch frequency. That way, new reps can learn your sales approach and messaging for themselves. As a result, you save precious time during the training and onboarding process, ensure a consistent experience for your prospects, and get new folks up to speed (and generating revenue) more quickly. Everyone wins. “Master Flow” mode: Other users can add people directly to an existing Flow, but they cannot modify any of the steps or templates. Each user will only see the people they add. This gives you a way to centrally manage the messaging in case you make updates in the future. “Individual Flow” mode: Other users can copy a shared Flow, then modify their own copy. That way, a rep can makes changes to their copy of a Flow and its templates. This is the best option when you want to provide basic guidance but allow your rep to customize the Flow based on their target companies, target markets, etc. 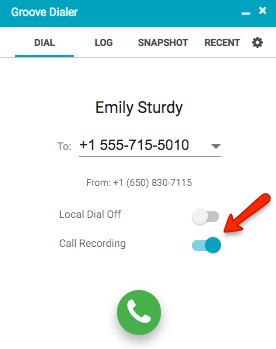 Did you know you can record calls you make with Groove Dialer? That way, managers can provide feedback on a new rep’s calls at a time that’s convenient, and pause and play the recording during discussion. Or you can save especially good (or bad!) calls for future trainings. Groove’s call recording feature integrates with several conversation analytics tools, including Gong, ExecVision, and Chorus. So if a manager has a lot of calls to review, they can loop in other tools to transcribe and analyze recordings. To record calls, your Groove admin will need to turn the feature on. Then, Groove users can select “Record call” when placing a call with the Dialer. By the way, it’s a good idea (and in some places, it’s the law) to inform everyone on the call that it’s being recorded for training purposes. When the call is complete, you can find the recording in Groove’s call analytics page, or your Salesforce admin can create a custom field for the URL. Keep the recording for up to 60 days, or store the file wherever you’d like! Have an onboarding or training trick you’ve discovered with Groove? We’d love to hear from you!